There’s an Italian proverb that says “Knowledge has bitter roots but sweet fruits.” This salad is a definite representation of this as Italians love to blend the bitter with the sweet. 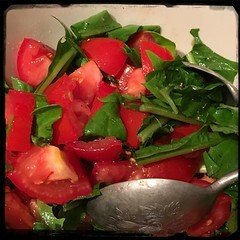 Our bitter would be the nutrient rich chicory leaves and the sweet would be the ripened plum tomatoes. This combination cannot be more refreshing!